There are 10 political prisoners in Spain. They have been segregated to 5 different prisons in Greater Madrid. Two guys with the beard are from some pro-independence organization. The remaining 8 are members of the Catalan government. 1 more member of the government, Santi Vila, "fully cooperated" so he or she wasn't jailed. Catalan president Puigdemont and 4 other government members stay in Belgium, cooperate with the Spanish courts remotely, but won't visit Spain because they don't trust the fairness of the trial. I don't trust it, either. And I agree with lots of dissatisfied comments addressed to the EU apparatchiks, e.g. Tusk (@eucopresident) & @JunckerEU urge China to free political prisoners. Good! But not credible with silence on me & 9 Catalans in Spain. Exactly. The political prisoners in Spain shed completely new light on things like the political prisoners in China that various European and EU politicians sometimes complain about. 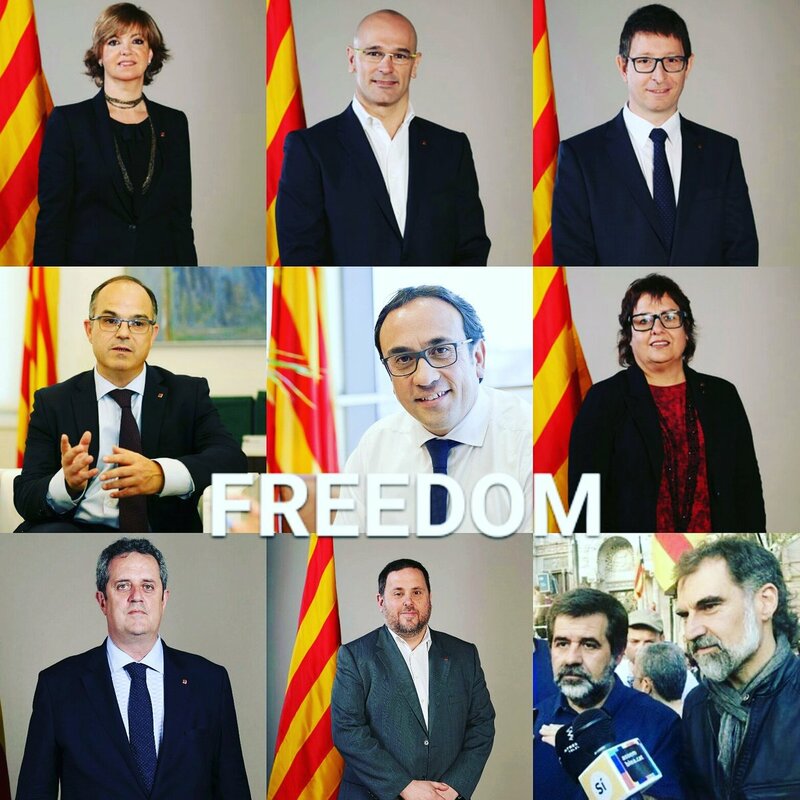 Interestingly enough, political prisoners in China are bad – but political prisoners in Spain, which is still an EU member country – seem to be completely fine for the hypocritical šitty likes of Mr Tusk, Mr Juncker, and this whole gang. Wikipedia defines a political prisoner as someone imprisoned because they have opposed or criticized the government responsible for their imprisonment. The Catalan government may be claimed to have done something "more" than just criticizing the Spanish government. They have signed various documents legalizing a referendum that the Spanish referendum didn't want to take place, and the declaration of independence that the Spanish government didn't want, and so on. But it's true in China as well. When political prisoners are placed in jail, the judge always finds "something else" that may be used as an excuse for the imprisonment. For quite some time, no one has been put in jail with the explanation "he has criticized the government". The term is used by persons or groups challenging the legitimacy of the detention of a prisoner. Supporters of the term define a political prisoner as someone who is imprisoned for his or her participation in political activity. If a political offense was not the official reason for the prisoner's detention, the term would imply that the detention was motivated by the prisoner's politics. What's wrong about the jailing of political prisoners is that the "sin" for which they're actually arrested should be a legitimate topic of political discussions and competition, not a part of the criminal code. In particular, what I find important is that millions of people in Catalonia – people with no criminal record – consider the political acts by their elected government legitimate. Millions of people in Catalonia actually endorse the recent acts of their elected Parliament and their government. At the same moment, these acts don't cause any genuine, paragraphs-independent harm to other people, e.g. Spaniards. They don't steal anyone's assets, they're not killing anybody or harming his health, and so on. An even clearer reason what's wrong with political prisoners: What's wrong is that a more peaceful and more reasonable Spanish government could approach the independence efforts by saying "OK, let's respect your wishes", just like Czechs did in 1992. The fact that the steps towards independence were turned into criminal acts in Spain depends not only on the acts by the Catalan politicians themselves; but also – and primarily – on the Spanish refusal to cooperate. And that's just a problem. The person or institution S (Spain) shouldn't have the right to jail C (Catalonia) just because S decided not to discuss a fair political plan favored by C.
In the tradition of the Spanish Inquisition, even words may be considered crimes. The freedom of speech doesn't really exist in Spain and certain people won't hide that they're willing to put you in prison just because you said something they don't like. The words and "invalid" declarations actually have additional consequences because millions of other Catalans take them seriously despite the Spanish courts' claims that those declarations are invalid. These two reasons are overlapping. Why? The first reason says that "even words may be considered crimes" but in general, there's some reason: words may be said to be just words but in reality, words also have additional consequences that aren't just words. The second point says what these consequences are. Words by elected officials are unavoidably taken seriously by many of those who elected them. And that's why these words are being criminalized – it's a prevention of acts by those who take the words seriously, e.g. the Catalan voters. It's the second reason that explains why it's myopic to solve these political problems by prison sentences. When you put a thief in jail, he won't steal anything because there's not too much to steal in the jail (unless he escapes). But when you're jailing Catalan ministers for the independence efforts, you are actually trying to imprison an idea. The ministers aren't the only carriers of that idea – it's very clear that "at least two million" Catalans share the idea. In this sense, the Catalan ministers were chosen as scapegoats but the Spanish government is indirectly saying that it is symbolically doing something that represents the imprisonment of these 2+ million Catalan citizens. And maybe it's not just about symbolism. It may become necessary for the Spanish courts to imprison many more people beyond these 10 political prisoners right now. It's not a good path simply because no decent government should be placing millions of people with a clean criminal record to jail – not even "random or elected representatives" of theirs. There are always people who want to change the constitution in some illegal way. Sometimes, they may be arrested for such acts. But these acts easily go away because such people are basically isolated exceptions. They can't get majority in powerful political organs etc. At least I assume they can't. But the Catalan independence is different. It has gotten a majority support in the Catalan Parliament and the Catalan government. So the incompatibility of these organs' opinions with the Spanish constitution as interpreted by a court is a political crisis, a conflict between several very important and at least "comparably legitimate and powerful" organs on the territory of (Greater) Spain. And political crises simply should be solved politically. I think that all the Spanish commenters – and TomVonk – are just detached from reality when they keep on pretending that the Catalan independence movement is just some irrelevant, mostly criminal effort by a bunch of characters that may be jailed or ignored while the bulk of the Catalan population wants to live in the union with Spain. Lots of very bad things have been done to the Catalans in recent years – and especially since October 1st. People in Catalonia have different opinions but many of them know someone who was beaten on October 1st. Even more obviously, look at the picture of the 10 political prisoners and think how many people in Catalonia liked this person or another person in the list. The political prisoners unavoidably cover quite some interval on the political spectrum. So the set of the citizens who like at least one of them is probably substantially larger than the set for each of them individually. I am virtually certain that a clear majority of the Catalan population "more likes than dislikes" at least one of the people who have been arrested. And that's already a systemic problem: a majority of the Catalan population can identify themselves with a political prisoner. Curiously, all the "arresters" are Spanish while all the prisoners are Catalan. Isn't their being Catalan the reason, one unavoidably asks? So "a person like themselves" or "a person whom they like" has been arrested for efforts that are considered desirable by a half of the nation. I am absolutely convinced that it's a greater half. But even if it were a minority, there is a clear majority of the Catalans who see something seriously wrong about the steps that the Spanish authorities have taken – and they will need to expand if they want to keep on playing this game that Catalonia is a part of Spain and everything is basically OK with this co-existence now. As I have predicted, the situation has escalated in recent 5 weeks or so. I believe that it's unavoidable that either the Spanish government will blink and start serious negotiations about some independence or at least greater regional autonomy; or the tension will keep on rising and an increasing number of people start to die at some point. If the Catalan politicians were really kept in jail for decades, those would be decades in which you simply cannot expect a friendly collaboration of those 2+ million Catalans who have voted "Si" with the Spanish regime. Many of them would do things that the Spanish government also finds dangerous or "illegal" and an increasing terror against the Catalan officials would have to take place, expanding the backlash at the same moment. The city hall in Barcelona – whose mayor, Ada Colau, is against the independence – has voted that they don't recognize the declaration of independence but they don't recognize Article 155, either, and Puigdemont is still the president, among other things. Is this "moderate" declaration of the Barcelona city hall "legal"? It's clearly moderate enough so that most of the Catalans are "more pro-independence" than this city hall. At the same moment, the declaration is still inconvenient from the viewpoint of the heavy-handed Spanish regime. The Article 155 has been started by the Spanish Senate so Ms Ada Colau should sit on her buttocks and worship the Spanish Senate. Of course, the Article 155 has been launched according to the pure Spanish centralized rule of law. These Barcelona folks are inconvenient. The Catalan ombudsman must also be inconvenient – or, in Spanish, "criminal" – for criticizing the application of Article 155. He's clearly doing just his work. Does Spain want to arrest all these folks who question the recent Spanish moves to various degrees? Millions of people in Catalonia simply find the Article 155 decision illegitimate. This may include lots of officers in the police at various levels, individual cops, whatever. Does the Spanish court system have enough judges to start to prosecute all these people? City halls in every other Catalan town? The whole system is crumbling because a supercritical percentage of the Catalan people no longer think that all the decisions of the Spanish organs may be taken quite literally. It's not just non-European and immoral but also extremely myopic to think of the independence movement as a criminal organization rather than a very powerful political movement that simply has to be negotiated with. P.S. : I am probably still underestimating the fanatical fascism of the unhinged Spaniards. According to some Catalan press, the Spanish army has declared to be "ready to effectively act" i.e. invade Catalonia. Wow. One should never underestimate what 39 million parasites are ready to do to keep on sucking €15 billion from a different nationality. Will we keep them in the Schengen Area? I surely don't want Spanish fascists to flood my country when some Catalans kick them into their stinky aßes. Incidentally, the Spanish press seems to be an inseparable part of the fascist machinery. Serious Offenses, an editorial in El Pais, justifies the imprisonment of the Catalan government using a very similar combative language that the communist newspapers that I remember used again the dissidents. By the way, to go half a century deeper to the history for analogies, I have listened to some videos with the most famous 20th century political trial in Czechoslovakia, one with the group of Ms Dr Milada Horáková in 1950. Some thousands of people were executed by the communists in the 1950s but this trial is famous because Horáková was the only woman who got a death penalty for political crimes – including treason and conspiracy; a letter from Einstein, Churchill, and others to the top Czechoslovak communists didn't help. She was only cleared of all the charges in 1990 and posthumously received the Order of Thomas Garrigue Masaryk instead. These political trials were despicable theater plays where all the results – and all the "ideas that should be voiced" – were planned in advance. Horáková and other "suspects" weren't really allowed to describe what they did and why. They were pressed to be just puppets in a monster show about the working class that has heroically dealt with some pro-capitalist villains who have teamed up with the evil dirty Western imperialists. The final verdicts – including this poetic, optimistic, and combative speech by Ms Ludmila Brožová-Polednová, a young female careerist pro-communist prosecutor whore who only died in 2015 (she was the only communist judge who spent 2 out of prescribed 6 years in prison – because she was pardoned by Klaus in 2010) – were prepared in advance. Spain is hopefully not going to hang the Catalan politicians but their desire to get this close to the Horáková Trial – and the implicit "OK" that they have received from the European Union etc. – is terrifying. Another topic: Cross removal. When Lidl removed the crosses from the Greek churches and we noticed 2 month ago, many of us said that it was a matter of time before real crosses are being removed as well. Shockingly enough, a French court has ruled that the cross has to be removed from the statue of John Paul II, the popular former Pope. The cross "violated the law on the separation of church and state". Wow. When a government pays for a statue of a church official, there's obviously an event that includes both state and the government but it doesn't imply a linking of them as long as the church official gets a similar treatment as other important people. And it's no justification for the removal of crosses from him. He was the Pope, how he could be stripped of his cross? Both Poland and Hungary offered to move the statue "home" and save the cross instead.